In 10 days, the last livestock pens at State Fair Park will be emptied. The last exhibits will be removed. The last corn dogs will be sold. Eventually, most of the buildings will be sold or scrapped. A few will remain -- remnants of the past, but made over for the future. University of Nebraska athletic director Bob Devaney and State Fair manager Henry Brandt guided its construction 33 years ago. The Huskers needed a better venue for basketball than the old university Coliseum; the fair needed more exhibit space and a more inviting place than the old grandstand to stage first-class entertainment. Today, the Huskers would like to play basketball in a new arena. The volleyball team prefers the renovated, more intimate Coliseum. But the university spent $8 million to improve the Sports Center a few years ago, so it still has a future. A conceptual model of Innovation Campus even shows an addition. A $3.5 million transformation turned the former livestock arena into a hockey rink for the Lincoln Stars in 1996. Said Mike Ayars of Ayars & Ayars, the construction firm that headed up the project, "It was dark, gray and old, but it had a unique structure. It's a building with character." The 1977 grandstand, the fair's third. Horse racing will stay for at least three more seasons. Very preliminary plans call for a mile-long track and grandstand -- Goldenrod Downs -- near the Lancaster Event Center, but they come with an estimated price tag of $50 million. There's no grandstand in the grand plan for Innovation Campus. Consultants helping plan Innovation Campus have identified three other buildings that might be preserved because of their cultural and historic significance: the imposing 4-H and Industrial Arts buildings and the comparatively tiny State Arsenal building. An earlier state fair board study said construction of the Industrial Arts Building in 1913 and 4-H Building in 1931 "set new architectural standards" for the fair. "However, the standards were short-lived and, with the exceptions of the Grandstand, Coliseum/Ice Box and a small number of brick structures, the newer ones are pre-engineered metal buildings," the study said. The 68,000-square-foot 4-H Building could be used as a multi-purpose facility, the university's consultants concluded. But it needs a new roof, doors and windows and has ventilation and accessibility challenges. Two years ago, the 4-H Building was the focus of a projected, renovated future for the park. The fair board voted unanimously then to seek funds "to make it the crown jewel" of the fairgrounds, quoting board chairman Jerry Fitzgerald. It would have been the first major construction at State Fair Park in three decades. The price tag was $4.45 million. "Not discounting the fact that this building serves a useful function, its strength lies in the fact that it makes a very eloquent statement expressing the longstanding history and tradition of the fairgrounds," the consultants said. "Its placement on the main circulation path only reinforces its status." The consultants offered a less encouraging report for the 90,000-square-foot Industrial Arts Building, another long-term anchor that was mothballed several years ago because of a leaking roof and structural concerns. Repair cost estimates ranged from $2.4 million to $6.1 million. But, unlike the 4-H Building, the consultants also included a $375,000 demolition estimate. Innovation Campus consultants said the building needs extensive exterior repair, new doors, windows, roof, plus stairs, ramps and toilets for accessibility. It could house plants, the consultants said, but they couldn't envision many research uses. They labeled its future as "borderline." Built in 1913, it was the first permanent facility provided by the Nebraska Legislature for support of the Nebraska National Guard, successor to the Nebraska Volunteer Militia. The two-story, concrete and brick building was used by the Guard primarily as a warehouse. It served at a time as headquarters for the 43rd Army Band. 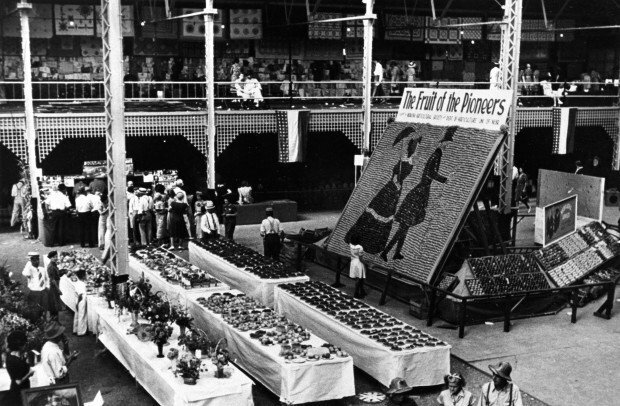 In 1963, ownership was transferred to the state fair board. Today, the building serves as a fair-week-only National Guard museum. It was listed on the National Register of Historic Places in 1981. Innovation Campus consultants said it could be preserved as a "historic artifact." When the future takes over State Fair Park, the handful of buildings left will provide a bricks and mortar legacy. The rest will be razed or recycled. Reach Bill Eddy at 473-2651 or beddy@journalstar.com.